The sun is shining and the sunglasses are on. 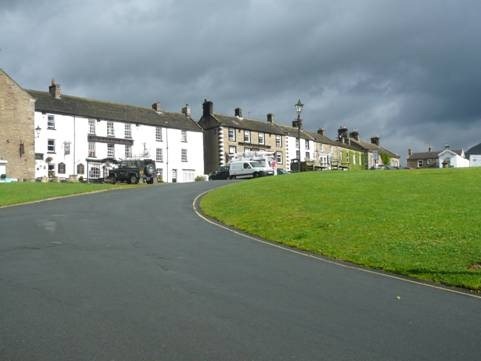 Keld village is fresh and quiet in the golden morning light. We did not dream of Julia last night after all, and I have got over my tussle with the plughole which refused to open. Out on the trail, the Australians are off already. We have a choice today. The more adventurous of the party may choose the ‘high level’ route via old lead mines and industrial devastation. 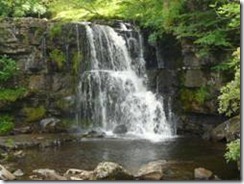 The rest of us have the option of an easy 4 ½ hour walk beside the picturesque Swale. 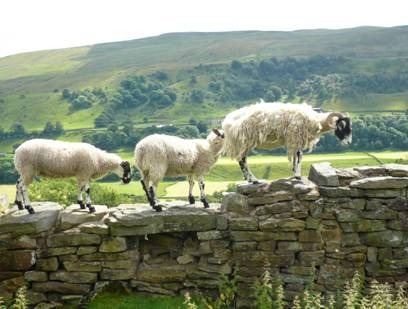 This is Swaledale after all, and it would be a shame to miss it. Anyway, by the time we have diverted slightly to look at a waterfall, the weather seems to have changed its mind (It was the sunglasses that did it). 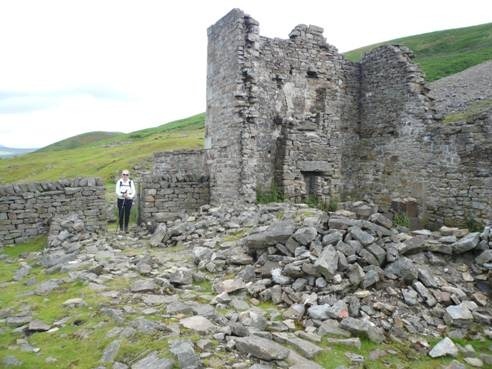 We proceed up the high route path as far as Crackpot Hall, a very much ruined farmhouse, before definitely deciding to retrace a few steps and take the lower route. Almost as soon as we get down to the river and Ivelet Wood the air is full of the presence of rain. We decide to don the rainproofs. Good timing. We are hardly in them when it starts in earnest. It turns out to be the most furious downpour of the walk (at least one that we were actually caught in). The rain continues for most of the morning. Glad we didn’t opt for the high route. Whatever. 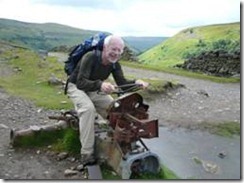 This provides an excuse, if one were needed, to divert down a paved path through a meadow to the tea shop in Muker, where we are later to be found sitting damply with Bob and Priscilla, and those two from day one! Whatever they were called. 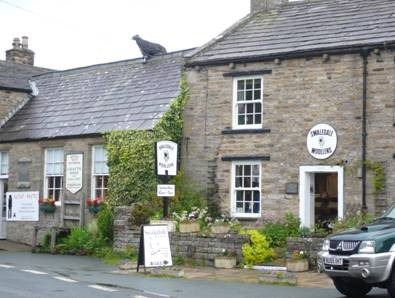 Muker is a great little touristy village with art shop and public loos, craft shop and woollen outlet. Plus a sheep on the roof. Must be on the coach tour itinerary. The walk beside the river is lovely, and not really wet underfoot. At this rate we will be in Reeth by early afternoon. 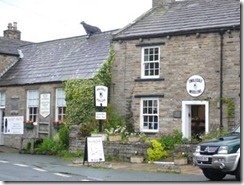 Therefore we have no trouble at all finding a pub for lunch in Gunnerside (The Kings Head) where we enjoy an enormous Ploughmans with 3 different local cheeses and a beer. Things were rosie by the time we left the pub in a relaxed state, the rain having stopped. Sadly, dear reader, we had been sold a pup. 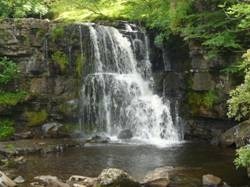 The path did not continue in easy and leisurely fashion beside the river, but diverted upwards. Firstly we went too far up the road, missing the automatic gate, which was, in fact, more impressive than it sounds, as we found out after turning back again and locating it as a vehicle went through. Can’t see how we missed it. 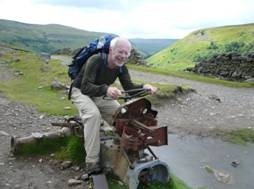 Anyway, now ascending steeply (this is more like the C2C we know and love), we pant on past many a dead rabbit carcase. 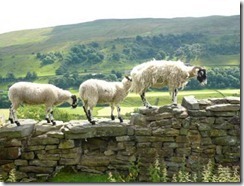 Later there are 3 sheep posing on a wall. 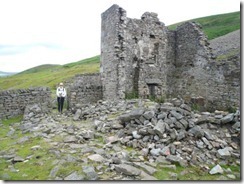 We emerge onto open moorland where there are many paths to choose from and promptly get kind of lost again. So much for lunchtime drinking. Ray says we are heading in the right direction anyway, so we keep going. And yes we do eventually find the hamlet of Blades, but Bob and Priscilla are in front of us, even though they left the pub after we did. Also, no offence, but I would not call this a low level walk. 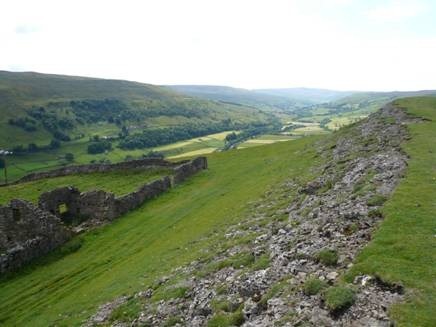 We are high up on the side of the Swale valley. Also, although THE BOOK shows short distances and not many landmarks IT LIES. Well, about the distances anyway. The afternoon has opened out for a bit, but as we walk towards Kearton there are noises over the wall as if someone is shooting. All those (prejudiced) thoughts about weird and hostile locals, inbreeding etc etc spring to mind. When we get around the end of the wall we can see three or four land cruiser type vehicles at the top of a field. Presumably the gunslingers posse. No wonder there were dead rabbits. We are not allowed through Kearton. Its private. So we have to make a steep and muddy detour in order to by pass it on the road. Beyond the farm we catch up with Bob and Priscilla who are in a state of shock having been hit by air pellets from the wild westers up the track. They were visibly shaken but luckily no real damage was done. Whether it was intentional or not is hardly an excuse. They are really upset, but are not planning to report it. Wainwright didn’t mention the chance of getting shot! Ah Yorkshire, you see fit to match your unfriendly stereotype. They seem to need company, so we walk with them down through Healaugh, past a Morris Minor in working order, and eventually rejoining the river bordered by a rabbit infested field full of collapsed burrows. (Where are people with guns when you need them?) By now it is late afternoon. It has been a long old day. Not at all what I expected. 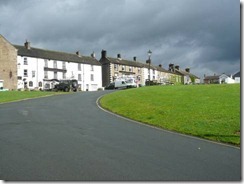 We pass the Reeth suspension bridge, and make it into the town as all the tea shops are closing. 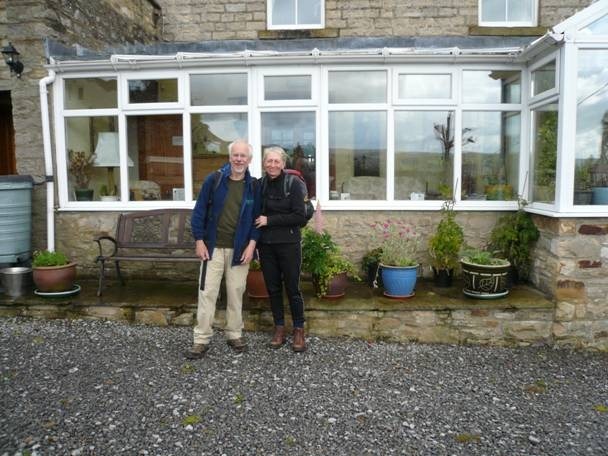 Then we realise we are looking for Cambridge House, a B&B well out to the north of Reeth. That last hill is not enjoyed. Especially when we pass the town boundary and we are still not there. When the owner greets us with a ‘joke’ that we still have further to go I must admit I do not altogether see the funny side. He only means around the back to the boot store and drying room though. Once we have debooted he comes up trumps with homemade cake and tea in his conservatory overlooking the town. Not such a bad old cove after all then. Les. What can you say about Les. He obviously enjoys running the B&B. He has already lugged our suitcases up to the bedroom. He greets the guests, cooks the breakfasts and does all the front of house. He entertains us with talk of his immense cycling career and horrific accidents, whilst also putting the world to rights in general. Next day he insists on taking our photo before we go. ‘Quite a character’ doesn’t quite do him justice. 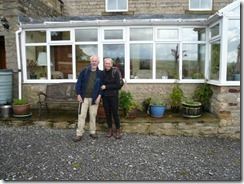 Later we are out in the rain again as we head back into Reeth to find food. We dive into the first pub, The Buck, only to find the usual suspects are already there. Food and beer great, we are soon sitting on a table next to John and Trish. He is ahead of us on the beer stakes, and is holding forth on the inability of bar tenders ‘down south’, or the bar tender of his local Golf Club in particular, to produce a decent pint of beer. Apparently, they don’t know how to look after it (??). This strikes a chord with the pub staff, and before too long, after the subject has turned to the use of ‘sparkles’ (??) to give the beer a head John is on the receiving end of his very own ‘sparkle’, so that he can take it back to the Golf Club bar. I wonder if he ever did?